For many children, especially those diagnosed with ADHD , Autism and Aspergers, clutter can be a huge distraction. It can cause stress and anxiety and inhibits creativity and productivity. In this post, we talk about visual clutter and how to reduce the visual clutter bombarding our children’s brain on a daily basis. These gadgets and products bombard us with messages, every second of every day. Important or urgent, do you need to deal with now or can it be left for later? Is it ok to be ignored? Life-threatening, Is this life threating do you need to protect yourself? Something which needs to be remembered, are you going to need to store this information for later. All of these messages are known as visual clutter and can be quite overwhelming to people who struggle to live in a cluttered environment. Are you adding more visual clutter to your home? Some of us may have chosen to add “extra” visual clutter into our homes by having ornaments which spell out words such as “bathroom” “love” or “home”, or choose to have busy and loud decor. I wonder how many times a day we subconsciously read the label on our shower gel, toothpaste tube, washing up liquid or moisturiser. If your house is extremely cluttered check out this post to help you get started on your decluttering journey. 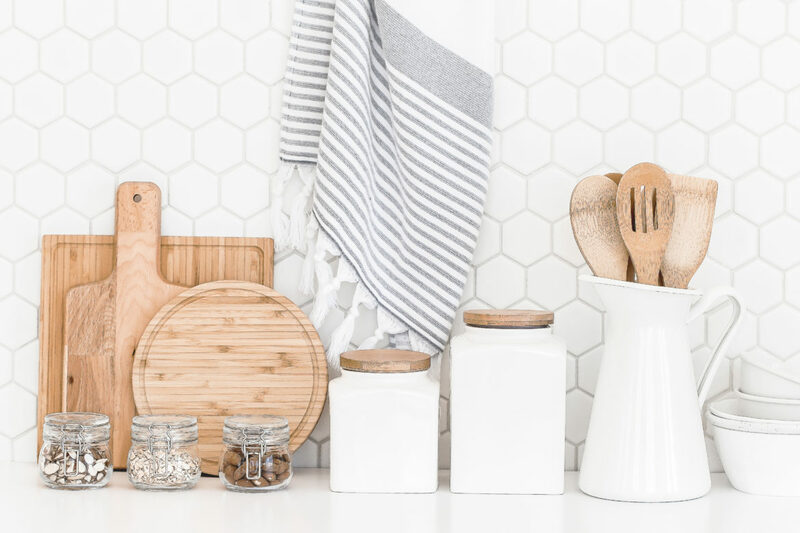 The decluttering guru Marie Kondo suggests we protect our homes from visual clutter by encourageing us to remove labels wherever possible from products we use daily. As a mother of two young children I figured this would be almost impossible for safety reasons, however, off I went to give it a go. I thought I’d start my experiment with the hand wash bottle, as I figured even my five-year-old knows that it is soap and it won’t get muddled with anything else. I carefully peeled away the label, full of hundreds of little words and I was left with a clear bottle, to my surprise, it felt great not to read the words “Imperial Leather Hand Soap”every time I washed my hands. The process then became addictive; once I started, I couldn’t stop! I started to remove the labels from with my stuff first and started will small things such as lip balms, moisturisers, hand creams, mascaras and items which were easily recognisable to me, and which other people did not use. When I peeled the label off my expensive moisturiser, it looked no different from any other cheaper brand, I felt annoyed at myself for being drawn into the brand’s consumerism and advertising, I suddenly realised I’d been duped. Every product looked the same without all the gorgeous packaging. I realised that I had been paying huge prices for the packaging, not the product inside. This revelation had a profound effect on the way I shopped; I immediately began to change the way I purchased luxury beauty products, which were a weakness of mine. It felt good, it was liberating and the thought of the extra money I’d saved in my bank account gave me more of a thrill than purchasing the product would ever have. The next step in my journey for a spa-like home was to carefully assess which communal items I could safely remove the labels from, without adding any confusion to a family who already has difficulty in finding things! Shower gel, I always bought the same shower gel, which hung from the shower so they recognise the product by where it hangs, the bottle and the colour. I store foodstuffs in glass jars and laundry powders etc. are stored in plastic containers. I only remove labels from bottles if they are easy to remove within seconds and are not dangerous to my kids. I never remove labels from cleaning products or anything hazardous. The benefits of banishing visual clutter. I love having fewer packaged products in my home as I think it feels so much more tranquil and clutter free it helps to bring a unity to my home. I no longer feel I’m subconsciously re-reading the same words over and over again in my home. No one in the family has washed their hair with conditioner yet, as far as I’m aware but you never know in our house! Other items causing visual clutter in your home. Besides the unnecessary labels, there are many other ways visual clutter creeps into our homes and makes us feel anxious and overwhelmed. Most of these problems are fixed by creating a routine to get yourself into daily habits to stop the build-up of these items. Read how to get organised and create a routine for your home here. If you liked this post leave us a comment below! Read Marie Kondo’s book today! Read how Cait Flanders didn’t spend any money for a whole year. How does a cluttered home affect my 7 year old son who has ADHD? A child with ADHD may struggle to thrive in a cluttered environment. Anything which will draw attention away from tasks such as homework , getting dressed etc needs to be reduced, clutter is one of those things! Children with ADHD struggle to organise themselves and the chaos of a cluttered home only makes tasks harder for them to complete successfully. How can I help my organise my home to make things easier for my child with ADHD? Make sure all toys are easy to put away, storage boxes or baskets with lids are better for children with ADHD as it helps keep toys out of view and helps to create a clutter-free space. Think about creating a kids capsule wardrobe to reduce clothing clutter, this will help your child get dressed in the morning as it will reduce the number of choices he has to make. To learn how to start a toy rotation system click here. Keeping things simple by using a toy rotation system will help your child’s focus and attention. Keep your child’s room visually uncluttered by choosing a neutral color palette for the walls and floors. If you prefer to use a brighter color, try to keep it to a feature wall only. What is visual clutter and why does it happen? Visual clutter is anything which draws and distracts the eye. It could be piles of paperwork or really bright wallpaper. Some visual clutter accumulates because we get blind to it, therefor we are not productive in clearing it away, similar to the hotspot on your kitchen counter that becomes a dumping ground for everyone’s stuff. look around your home and notice where your clutter hotspots are, and how much unnecessary clutter you have in your home . Why do some people find clutter comforting. Some people have difficulty letting go of their possessions and form a sentimental attachment to their belongings. It is almost like a comfort blanket to them, particularly people with hoarding disorders. The Organizer UK is a participant in the Amazon EU Associates Programme, an affiliate advertising programme designed to provide a means for sites to earn advertising fees by advertising and linking to Amazon.co.uk. Don’t miss out subscribe to our updates and receive the code to unlock our amazing FREE resource library! Prepping For Winter How to Get Cozy.